Up is a clean and beautiful Bootstrap based layout for Jekyll. This is designed to be an easy layout to modify for your own blog. It was based on zachholman’s blog themes: the “old” one, now opensourced as left, and also in his actual theme, that’s not opensource (I believe), but I steal some ideas anyway. I also took something from jekyll-bootstrap, and, of course, I’m using bootstrap as a base for all the thing. 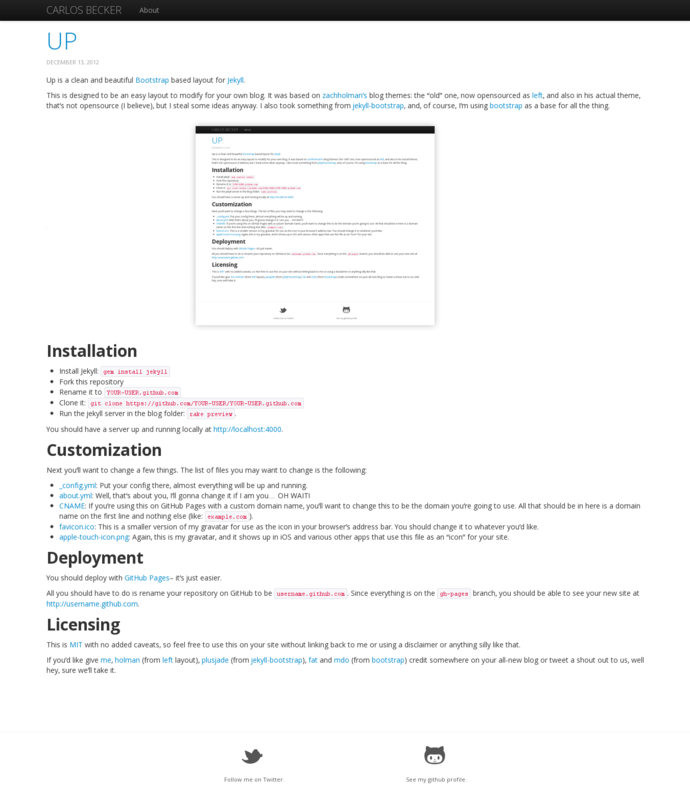 Run the jekyll server in the blog folder: rake preview. _config.yml: Put your config there, almost everything will be up and running. about.yml: Well, that’s about you, I’ll gonna change it if I am you… OH WAIT! CNAME: If you’re using this on GitHub Pages with a custom domain name, you’ll want to change this to be the domain you’re going to use. All that should be in here is a domain name on the first line and nothing else (like: example.com). favicon.ico: This is a smaller version of my gravatar for use as the icon in your browser’s address bar. You should change it to whatever you’d like. apple-touch-icon.png: Again, this is my gravatar, and it shows up in iOS and various other apps that use this file as an “icon” for your site. You should deploy with GitHub Pages– it’s just easier. All you should have to do is rename your repository on GitHub to be username.github.com. Since everything is on the gh-pages branch, you should be able to see your new site at http://username.github.com. This is MIT with no added caveats, so feel free to use this on your site without linking back to me or using a disclaimer or anything silly like that. If you’d like give me, holman (from left layout), plusjade (from jekyll-bootstrap), fat and mdo (from bootstrap) credit somewhere on your all-new blog or tweet a shout out to us, well hey, sure we’ll take it.